I've had a very good day today. The weather permitted for a scroll by the harbor with the boys. I even had time to get crafty!! I LOVE how the colors of this card. The image is from Flourishes: A Year in Flower 1. I used a color challenge and a sketch challenge for this beauty. I have SO MANY stamps that I have not inked up, because I have become to so comfortable with reaching for my digital images. So what I have done is, randomly picked a few sets from my box and I have to create something with them within the month. If I don't, then I have to either sell them or give them away. Sounds fair right?! We will see how that works out. See you again tomorrow for a SweetStamps challenge. This is beautiful Calypso. Such great coloring! Good idea, I rarely use a lot of stamps anymore either, should do something like you are doing. Glad you had nice weather and got out with the boys! That's a really great idea! I should try to do that and see what happens... Just love how your card turned out it's really gorgeous! Gorgeous image and embossing. The colors really stand out. Thank You for joining us at Loves Rubber Stamps this week and hope you'll join us again next week. This is so beautiful, love how you used this sketch and the fabulous colors and images. Thanks for playing with us over at Loves Rubberstamps!!! Very pretty. Thanks for sharing with us at Loves Rubberstamps this week! Hope to see you again. Lovely job here! You've colored the flowers in so beautifully. That twine ribbon is just the perfect touch to tie it all together perfectly. How gorgeous! You used this sketch PERFECTLY! Thanks so much for playing along at Loves Rubberstamps! Beautiful card Calypso!! Hope you get a chance to ink those stamps up, I actually use to use all digital but the past year have really enjoyed using all my actual stamps!! 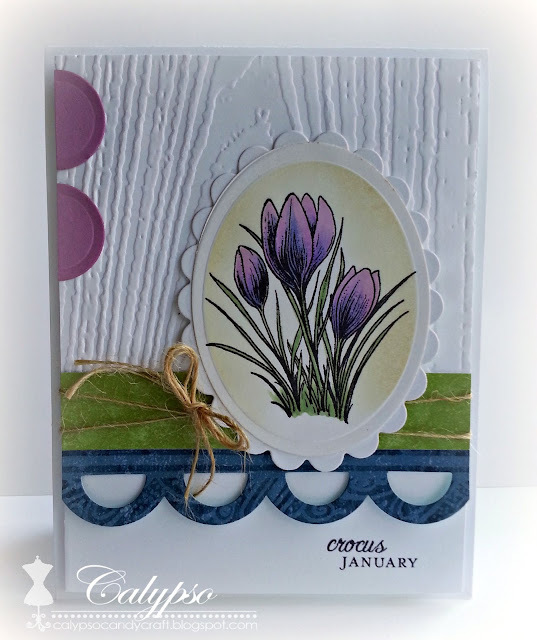 Thanks for joining us at Inspired By Stamping Inspirational Challenge!! Calypso your card is so pretty, I love that stamped flower. This is wonderful. I love your combination of textures and colors... very very nice! Thanks for joining us at the Deconstructed Sketch!